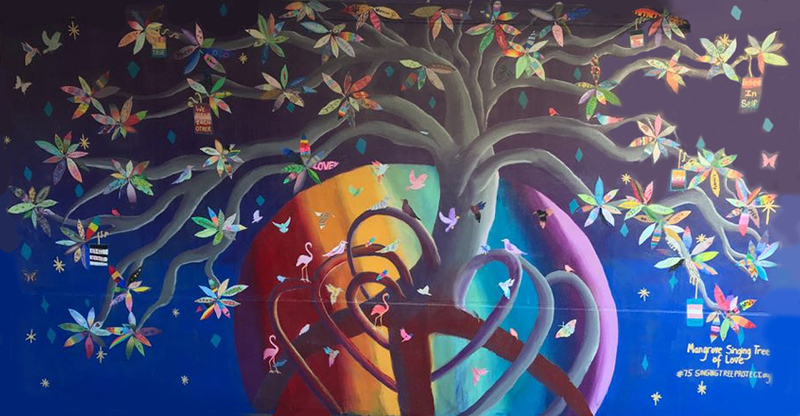 Westglades Middle School in Parkland, Florida coped with the first anniversary of the shooting at Marjory Stoneman Douglas High School on Feb. 14, 2019. There is nothing more humbling than facing the grief and helplessness that arises from the act of murder of innocent people. The shooter had gone to the middle school for three years. The staff had worried about him, but he slipped through the cracks. Many of the students who died had gone to the middle school as well. 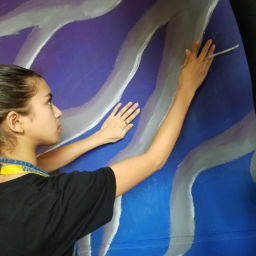 One high school student had visited, Deborah Golding, her middle school art teacher, the week before the shooting. She came to tell her what a great teacher she was. And then her young life was over. 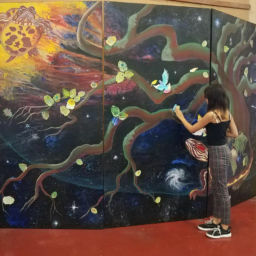 Through the help of De Palazzo of Equality Florida and a private benefactor, I was able to facilitate the 75th Singing Tree mural with 350 art and drama students. They creatively processed their community’s nightmare together by making a shared vision love in the face of heartbreak. 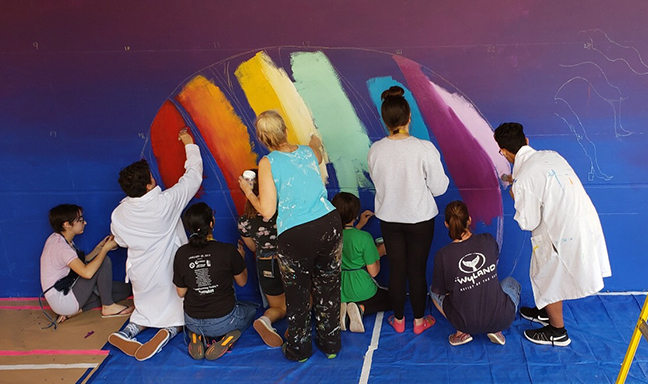 Six students from the Equality Club, which supports LGBT students, gave ideas for the design of the mural – a peace symbol, diamonds and stars in the sky, banners that symbolize different sexualities, Mangrove roots, a rainbow earth, figures in the trees and hearts. 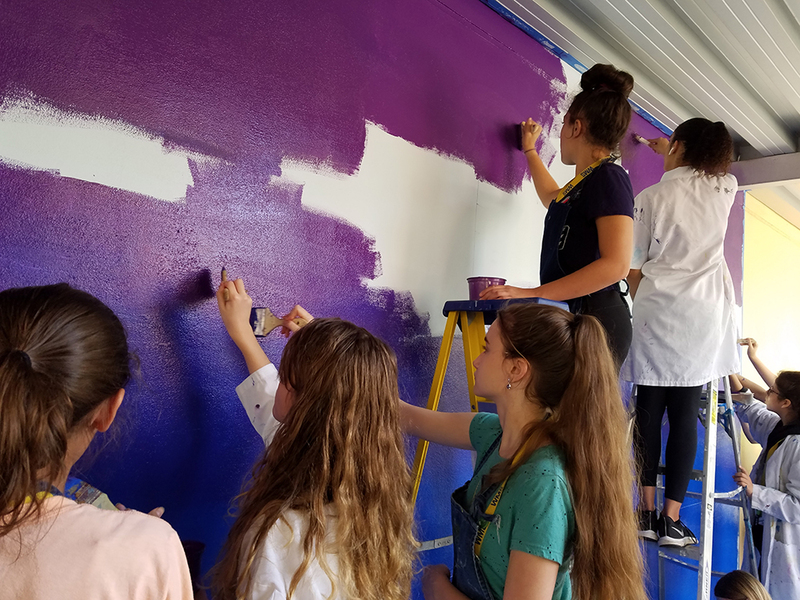 The Equality Club served as leaders for the inspiration of their school. 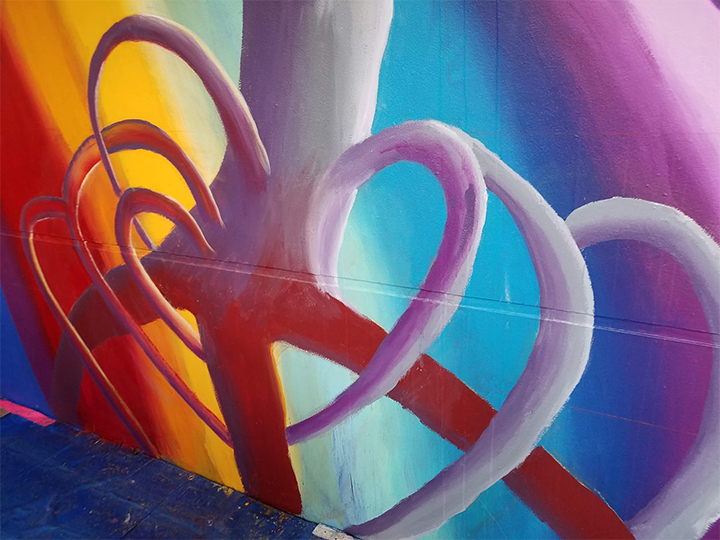 Here is a short slide show of the process of making this tribute to love and resilience. We hope it is soul strengthening to deal with the heartbreak of gun violence and young death, transforming pain into beauty. 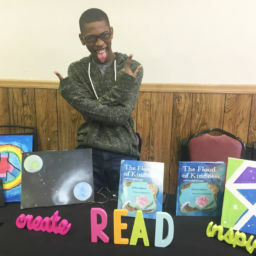 We strive for a world where every child knows they belong, they have purpose, they have meaning, they are unique and they are loved. You’re message and heroic work continue to inspire me! The tragic suicide deaths of the two Parkland students must not be in vain, but steel our resolve to carry forth with our mission to both, heal, and ultimately deal with the underlying causes of these unspeakable acts. This is very uplifting to see our young people be open with their expressions of love and hurt all at the same time is very inspiring to me. I am sorry that this tragedy happened but very grateful for the enormous outpouring of love and support for the victims and survivors that have been expressed throughout the world.